Marylou: Hi everyone, it’s Marylou Tyler. This week’s guest is one of the utmost, formative experts in everything social selling. I met Brynne, at a trade show, I think it was. When I went to their booth, she’ll tell you about the other professionals with whom she works. I was just blown away by the knowledge of what they know about social selling. I’ve asked Brynne to come on the podcast today because not only is she the author of The LinkedIn Sales Playbook: A Tactical Guide to Social Selling, which you can get on Amazon and probably other places, too. She is really very knowledgeable about how to incorporate social selling into what we do––our direct outreach. The reason why you listen to my podcast is all about predictability. There may be a way to utilize social selling to help with that consistent predictability and repeatability that we’re looking for in building our pipelines. Brynne, welcome to the podcast. Brynne: Thank you so much for having me. I’m excited to be here today. Marylou: You are one of, I think four or five now, that have come together as a group of experts to help us understand what social selling is, how to leverage it in our business? 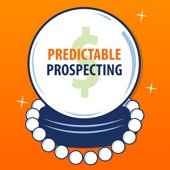 I’d like to talk about prospecting because that’s my favorite topic. I’m sure you’ve covered the entire pipeline. Also, understand where we begin if we’re a newbie. I consider myself a newbie. I have connections on LinkedIn that I don’t really know what to do with. You could start wherever you want. I’m really intrigued by the collection of professionals that are now your team. The floor is yours. The first question I always have is, the title is the Tactical Guide to Social Selling, what does that mean? Brynne: Oh, yes. My book. My book is The LinkedIn Sales Playbook: A Tactical Guide to Social Selling. It’s exactly what it is––it walks you step by step from the first minute all the way through the social selling journey for not only LinkedIn, but there’s a little Twitter in there, a bit. Primarily, LinkedIn and it really covers essentially the four major areas of social selling, which is first, the profile which is your foundation. Having you present yourself, the thought leader and subject matter expert, attract, teach and engage your buyers, get them serious and wanting to take your call. The second piece is having engaged in your new and existing network and stay top of mind. Be seen as a thought leader through sharing content, both original and curated. Ultimately, build a reputation and credibility as the subject matter expert. The third one is something which I totally, absolutely, I’m obsessed with and it is how do we find and engage with targeted stakeholders by leveraging our current network to get warm introductions and how do we get on the radar of people that we would normally have cold called and warmed up, so by the time we get on the call, probably scheduled and they’re excited to talk to us. The fourth piece which I think is absolutely critical is content. How are we feeding our network of thought leadership––thoughts, ideas, strategies, and insights––that lead them back to our solution. Marylou: Okay, wow. Foundation is profile. Is LinkedIn is still seen as a glorified job description, talking about what it is you do in terms of in the eyes of getting another job or is profile the selling piece––the big business card, the billboard of who you are as a professional and how you help others? Brynne: That’s a great question. If you are in business development, you really want to make sure that you are building your profile, but engaging your targeted audience. A glorified resume doesn’t do it. Years ago, I coined the term from some resume to resource, but then it sort of stuck. I think that’s really the goal, what does our audience care about. In fact, let’s go one level higher and say, “What is our goal of social selling?” In most cases, the goal of social selling is to get more phone calls and qualified buyers. It’s not to actually sell anything, it’s to start to call people on wanting to have a conversation. If you look at it from that perspective, then we have to make sure that everything that we’re doing is working for that goal and that includes our profile. They don’t about your mission, your passion, your years in business. Yes, you haven’t earned the right for them to care about you personally, all they care about is what’s the value to them. When you can convert a certain resume or a resource and you’re providing insights, you are creating both curiosity and credibility. When you get the right person at the right time, then they’re going to raise their hands and want to have a conversation. Marylou: When you say raise their hand, is that connecting with you? Or is that the fact that they viewed your profile? For us, in direct outreach, there are three areas that we can engage. We obviously can engage when someone replies to our request. We can also engage when someone links through to a content piece that we attached in our email or left a voicemail and directed them to. At the very high level, if they open our email, that could be enough for us to connect that way. What is the LinkedIn sort of hierarchy of when it’s appropriate to start connecting and start sending messages to prospects? Brynne: I love the cadence part of that question of versus hierarchy of what do we do to grab their attention and get them to our profile and get them to a phone call? There are a few things that you can do initially before you connect with them. You can like, comment, and engage on content that they’ve already shared. You can follow them. You can engage with people in their inner circle. If they actually engage with people on LinkedIn, you can engage with them. You can drop your presents in little mini bite-sized pieces and then when you actually do reach out on LinkedIn. “Hey, I’ve been following you for a couple of days, I see some content that you shared or you’ve engage on. I had a chance to look at your profile. I’m really interested in…” say something personal about them. “I’d love to connect and I have some insights I can share with you once we do.” You connect with them. Then, you send a welcome message. Now, you’ve provided something of value and I’m in PointDrive which is an enterprise level Sales Navigator product. I can see PointDrive––it’s sort of a landing page of content. I can see stopped by, how long they were there, what they downloaded. That’s pretty cool. Now, I engage with them based on what they’ve read. Of course, I want to ask that question when they ask that question if I know that they clicked through, I can certainly respond to them with that knowledge. If I know they didn’t click through, I can respond to them with that knowledge. I would say, if I end most my messaging with either, “I’d love to hear your feedback,” or “Can I ask you a question?” I get probably 10% to 20% of those folks that actually start a conversation. Marylou: That’s a pretty good number. Brynne: It’s pretty good, yeah. The other piece is how do I warm them before I have a phone call with them? If I share a really good piece of insight with them, something that’s really moving, I may follow up with a message that now says, “I hope you’ve got some value from the content I shared. I’d love to jump on a quick call and share some additional insights specifically to your situation. Even if we never worked together, I’m confident the call will provide a lot of value. There’s a link to my calendar. Pick a time that works best for you.” Now, that’s one way. If I’m going to reach out, I could say, “I’ll be reaching out next week. I’d love to share additional insights. If you’d like to schedule sooner, here in my calendar.” When you do that, you’ve actually told them that you will be calling them. Even if there’s a gatekeeper, “Is she expecting your call?” “Yes.” Like you said, you’re calling. Marylou: Right. Like that as well. We do a little bit of mini test in one of my classes since I’m not a LinkedIn expert. We did a high level permission-based test where we sent to a prospect that we were hoping to connect with. We told him about an article that we had written, that we thought maybe of interest to them. The email or that message in LinkedIn just really said, “Please, get back to me if you think this article is of interest and I’ll send you the link.” We didn’t even include the link inside the body of that first request. We just put the fact that we had this document, we gave them some results of what they could expect if they were to read the document and implement. Then, politely asked them to get back to us with the link. Marylou: Yeah. That’s why I’m excited about this, but not really sure from there how to mechanize that process, so that you do this on a daily basis or whenever you’re prospecting, it becomes a habit to reach out to “X” number of people with this type of cadence as you call it. With the goal, its call action, may be different depending on what it is that you’re trying to accomplish. It seems to me what you’re saying is there’s a rhythm here. There’s maybe a daily interaction of doing this? Marylou: Yeah, okay. Based on segmenting accounts and doing all that just like we do? Brynne: This is sales. It’s just using social as a tool. It’s certainly not siloed by any means. It really does need to align with whatever your other sales activities are. Really, social selling makes it all easier. It’s the best way to look at it. The highest level of logic of LinkedIn, LinkedIn provides that no other tool in the world does, is the ability to search and filter your connection’s connection. You can identify you and your network, can help you gain access to targeted people. There are lot of different ways to this with your ABM or Account Based Marketing, an account based salesperson, or if the world is your oyster, whatever that looks like, you do, you figure out who is your ideal client, your buyer, using LinkedIn filter. Then we use the second degree filter, so who in your network knows these ideal people. Sometimes they’ll be hundreds if not thousands. It’s amazing the level of connection that one degree holds for us. Now, I have the opportunity to either look broadly or look at one-person-connection and see who they know. If it’s a client, how am I identifying who that client is? And positioning myself to ask them for referrals? Those are all really important things to do. If you’re going mass scale and want to connect with 10 new people every single day, you need to have a plan around that. Maybe, it’s three companies a week or five, maybe it is a company a day. If you’re going after companies, maybe you’re going after particular titles in certain industries like you’ve got to figure out, “What I want to do? How much time do I want to invest? What is my biggest bang for the buck?” When it comes to prospecting. If it’s a call center and you’re expected to make 40 outbound or 40 conversations a day, sometimes, when I start working with a client if they’re outbound, that they’re responsible to do. We might modify that and say, “You know what? The goal isn’t really 40 outbound, but five meaningful conversations.” It may not be necessarily an outbound call. It might be some schedule because I had a great engagement on LinkedIn. We gave them a LinkedIn schedule, a call with me. Brynne: But it’s probably worth 40 calls, one of those is probably worth 40 upend dials. It’s reevaluating what are our ultimate goal is, and when I talk to––I know what to expect on inside sales, although, we don’t do it across the board, sometimes, I will start with, “So, what is your goal for your reps?” It’s like, “45 calls a day. 45 calls a day.” I say, “That’s really your goal?” “Yes, that’s our goal.” Well, it’s actually not your goal. It should be how many people became a lead? How many leads are we getting? How many meaningful conversations are we having? If you think 45, maybe 10 can do it. Maybe you need 100 to do it, but let’s set the goal as a results goal that we really want to do. The activity goal has to become second. This is getting what we want to achieve and then what activity can we do to get the right goal. A lot of times, just dials isn’t going to get up there. Believe me, you have to have conversations, but our goal is more conversations. There are a lot of ways to warm things up and get people not just picking up the phone when you call, but excited to talk to you because you are now a thought leader that they come to with insights and can guide them. I may have gone on a little off tangent there, but I think it’s really important as sales leaders that we look at, is what we’re doing working toward our goal? Or is it working towards sort of this number that we’ve put out there because we think it means something? Marylou: That’s perfect. With my students, we work on what we call a waterfall. We start with the number of opportunities we’re looking to generate, let’s say, in a month. From there, we look to see, how many discovery calls? Qualification calls? Were you meeting the decision makers together with your team, their team? How many of those do we need in order to generate the number of opportunities that we’re looking for? We just keep working it up, up the pipeline, up the funnel, until we get to the number of, in our case, phone conversations or emails that are meaningful in nature that get us that first meeting. It sounds very similar for social selling, but we actually have benchmarks. We actually have at each step, a goal in mind to work towards, and we start with the benchmark. We may exceed it or we may fall short depending on the industry, the prospect types, et cetera, the roles, but we have sort of a baseline of that waterfall. Does something like that exist for social selling? Or is it because of the nature of social selling and the personas that it’s difficult to do that? Brynne: No, I mean, there is a chastity of the CRM and we’ll put all of the stages. Remember, for us, the social selling is aligned with our selling. It’s just a tool that we’re using, too, as a sales process. Depending on where you want to start to measure, if you add them into the CRM and you just track it from there. There are other metrics that you can measure like the number of new right connection out of the search. Let’s say we’re selling to CEOs in the medical field. We can do a search in someone’s connections, and say, you have nine and then in a month, when we’ll meet, you’ll have 40. Now, I know you’ve got 31 new connections. We can look at that as one of the benchmarks. Now, we can see if our goal was 40 and we’ve got 31. We can see, did that hurt the rest of the benchmark? Let’s say we wanted 25 and you’ve got 31 and you still didn’t meet your future benchmark, then maybe 25 was the wrong number. We start to use those––we have to adjust the benchmark. It’s usually five, six, or seven, depending on how long the process is. It could be as little as three for very low cost sales like a fast transaction. If you can’t see where it’s broken, you can’t fix it. You need to make sure that you’re measuring at each stage and then look at where––did this stage could get you to the next one and meet your goal? Each stage, they’ll want it, so you get to that result. You can easily see where the chain is broken and where the system is failing so you can change it. Marylou: That’s great. I like that because I like the idea of marking, I call it on a freeway, we’re marking the mile markers, which are the meaningful conversations. We may have points of interests along the freeway that are more meaningful than just the mile markers. Those are the stages. We also want to attract what goes out––what fell out and why? So that in the next search that we do to build our members, to go after, we’ll be smarter with our segmentation so that our numbers should improve. It does sound like it’s a crawl, walk, run, type of rap, which I’m happy to hear that, too. You’ve got to put some skin in the game to figure out where it is your sweet spot is and it is not the same for everybody. Brynne: That’s correct. There are some basics that can work across the board, they’re definitely foundational KPIs that we can work off of. But, when we work with the sales team, we try to really customize it, but align it with their existing stages, make sure that it works into their CRM, and that we’re attracting everything appropriately, that the KPIs that we’ve set are based on proven data in the past, so it’s not like we’re not starting from scratch every single time. Every company tends to be slightly different. Marylou: We know that from the work that we do in outreach, a case and point would be, we did a campaign where we were looking at liaisons––IT liaison people. We found in our house list that there were 500 of those that we can call into and go after. When we did a LinkedIn search, there were 50,000. Same role, same process, so we had really have to adjust where we were going to put social selling into that mix because we weren’t going to update our list––our house list at all. We needed to really start looking at the social aspect as one of our main channels for prospecting. Once we understood that, list size differences, we were able to engage accordingly with the folks, in this case, on LinkedIn. It made a big difference for us to be able to take a universe of people that would be qualified to have that first meeting with. Although, most of them sat in the social environment as opposed to inside the company list. Marylou: You’ve mentioned a couple of times, when we go in with the process, tell us about the relationship you have now and how a typical engagement works from the standpoint of the foundation? I’m a company who is wanting to invest sales time using social selling, not really sure where to begin. I also have right now an inbound channel that generates maybe 25% of our revenue. The rest of it is at direct outreach. I know the importance of social selling, but I’m not really sure how to go about that. Can you talk us through a typical scenario for onboarding of social selling environment for sales? Brynne: There’s really 10 major steps. The very first one is defining the KPIs in your goal and the desired outcome of the program. If you don’t do that, it’s impossible to put together a program. A lot of people will start a social selling program and not have those KPIs identified. You can never measure if it is working or not if you don’t do it, so start in KPIs. The second one is buyer identification and mapping. A lot of times in sales, we’ve been taught in marketing to create this persona of the people that we’re going after. I don’t care if they’re married with three kids, a dog and a Mercedes. That’s not what I’m looking for. What I’m looking for are the filters inside of LinkedIn that make up my perfect buyer or as close as I can get based on how I can search for them. Sometimes it comes with kind of breaking down the search features of our ideal clients today, but we really work at creating identification mapping and search strings that will make sure that we are getting as close to the ideal buyer as possible when we’re doing our searches. The next piece is identifying the content strategy––curation, creation, and distribution. As an organization, what’s our content strategy? Once we get through that, we are able to choose our digital tools or productivity tools which can be anything from free Chrome extensions like autotext standard to scheduling tools like Calendly, or with Sales Navigator, using Twitter, or we’re using an employee advocacy tool content sharing platform that the organizations can define, “What tools are we using?” And make sure that it’s all through IP and all that stuff. Then, we develop our customized playbook that’s aligned with our current sales process. My book is a generic playbook. The book that is on Amazon. We’ve kind of tweaked that and customized it for each client, that comes up. Customize it for each client which includes––which is actually––it goes into step six, but includes developing custom profile taglines, banners, job description, summary, to make that we can surge the client in our playbook, so that they can easily copy and paste their profile and tweak it if they want to make it personal, but we know that sales people, if we just tell them to do it and undo it if we serve it up to them on a silver platter, there’s a better chance that they’ll implement it. But also, in that playbook, what is a daily activity that lead to our KPIs. We actually will do that reverse exercise that you talked a little bit about. We do something very similar, but we identify what should the folks be doing on a daily basis. Step seven is the training. That’s when we roll it all out, train the people how to do it, get them feeling comfortable with the playbook, understanding what their daily activity is. Usually, we do workshops, so that they are practicing and playing that day. We actually have people, a lot of times we get the, “Oh, I can’t pull my people out of the fields for the day.” I’m like, “You’re going to get more appointments in a day in a workshop than you would if you’re in the field.” It’s really productive. We hope to the companies that they’re driving adoption through gamification, we can help with that, but gamification and recognition is a big deal and we have to obviously measure and we do a lot of––the shops continue, what are we effectively doing and continue doing, so we’ve got to make sure that we are effective and then we coach the teams to improve. Brynne: I think I got them all. Marylou: If you missed any, everybody knows where to find your book on Amazon. The LinkedIn Sales Playbook: A Tactical Guide to Social Selling. Brynne’s said she’s outlined the playbook––a generic one smack dab in that book. Start smart, download that, get an understanding of that. Lastly, I want to leave everybody with your connection with the team that you’ve started. I guess, it’s about a year ago now with Vengreso. If you’ll give us the “why” behind that, how you guys came together, and what your charter is to help us get better at social selling. Brynne: Thank you. There were a lot of individuals in the marketplace, they were sort of all solopreneurs, some slight entrepreneurs, but really just a lot of really good people in the marketplace, and Mario who is the CEO of Vengreso approached each of us individually and said, “How do you like to join?” They’re all forces. I don’t think any of us thought that he could make it happen. Initially, I’m like, “Yeah, I really appreciate it, and Viveka von Rosen, “I’ll talk to you about it.” Actually, I was the first one that said, “If you can get them, I’ll say yes.” But as we all sort of had, and I think everyone––no one said, “Oh, my gosh, that’s going to happen.” We all thought it was a great idea, but he pulled pulled it together and really, it’s been amazing just collaborating with some of the best minds in the business and really creating a company that’s really making a difference at scale now, so if we could do this for larger companies where we each kind of thought we could, but not nearly the way that we can in other worlds. Marylou: Right. The team members, Mario Martinez, Viveka von Rosen. Brynne: Kurt Shaver and Bernie Borges. Marylou: All right. Great team. For anyone who’s listening to this and wants more information on Vengreso, I’ll put it in the show notes of Brynne– of how to get ahold of her, how to get ahold of the company. Please, if you’re really considering adding social selling as a leverage for prospecting, get her book. It’s a great way for you to get started and get started smart instead of just like she said, you’ve got to start with those KPIs. It’s the same thing as my world. If you don’t do that work, you’ll never really know how successful you can be or how to scale it or even where to begin. I think that’s a great advice to follow those steps in the order that she indicated and that’s also in the book. Brynne, thank you so much for being a guest on the podcast. We wish you the best with your new company and the team and look forward to reading more and learning more from you all as time progresses because LinkedIn is one of those beasts that changes every 10 seconds, it seems like. Thanks again for your time. Brynne: Thank you. Great. Thanks so much.